A strange combination of superhero action and comedy that is pretty decent, especially in it’s first half. The Green Hornet is actually fun. I say it like that, because who would think Seth Rogen would make for a good superhero. The casting of him in the title role is very odd, considering that he is known as a pudgy stoner comedian. But then again, the choice for director here is odd too, with Michael Gondry (Eternal Sunshine of the Spotless Mind, Be Kind Rewind) being brought on boar to helm the film. And the funny thing is that it is only because Rogen is the star that the movie works. The comedy here is the number one best thing about this picture. Rogen plays Britt Reid, a wealthy son of a newspaper tycoon. His father, played by Tom Wilkinson, owns his own paper and is a jerk about the way he does things. Early on in the movie, we see a flashback of Wilkinson ripping the head of his son’s toy because Britt got in a fight at school. It doesn’t seem to matter to the father that Britt was helping someone who was being bullied. We meet the adult Britt, played by Rogen, with a refrigerator getting thrown through a glass window and off a balcony at a party. Then we go into the party and see this guy having fun. This is not your typical superhero movie. Normally the father is some larger than life moralistic character who can do no wrong and the son isn’t far behind. Here, both father and son are flawed. But like all those other superhero films, the father dies early on in the movie and it’s up to Britt to take over. He takes over the paper, and what’s funny about that is that he doesn’t have a clue how to do it. Britt is also used to having everything done for him around the house, and we learn quickly that he has fired everyone who worked there. Why we don’t get to see this or get a reason for why he fired them, I still don’t understand, but none the less, he now wakes up to a crappy cup of coffee (who put it there, beside him, while he was sleeping? ), and goes out to find the guy who used to make his coffee for him every morning. That guy is Kato. While Britt is getting his life together, we also join the storyline of the movie’s villain, Chovnofsky, played by Christoph Waltz. This guy is a lot of fun. As an actor, he is perfect playing a villain, just as he did for his Oscar winning performance in Tarantino’s Inglorious Basterds. That movie was, of course, Waltz’s breakthrough, and a hell of a casting job of scouting him out by Tarantino. 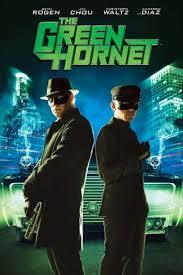 Here, in the green hornet, Waltz is again, a total blast. Like Rogen, he plays for the comedy here, having an early scene with James Franco, where he shows concern about his name and being considered scary by his enemies. Franco has only got this one scene, but he has a lot of fun with it, giving Chovnofsky suggestions before watching his men get gunned down. What really makes this movie work, more than anything else, is the dynamic between Britt and Kato. Britt is the big, blundering fool, and Kato is the quick, quiet Chinese guy who is immensely talented and a hell of a martial artist. Kato was played by Bruce Lee in the TV show of the green hornet, and in a lot of ways this actor playing him here, Jay Chou, reminds us of him. In fact, Jay Chou in this movie seems to be a combination of Bruce Lee and Jet Li. he moves like Bruce, but he talks and acts like Jet. And Britt is blown away by everything this guy shows him, starting with the massive coffee machine in the kitchen of the mansion where he lives. Kato’s primary job for Britt’s father was always to maintain and do work on the cars. And so, he builds Britt a new car and they discuss how much they both hated Britt’s father. They go out to cut the head off the statue of the father (what superhero would ever do this?) That’s when they come across someone getting mugged and go into superhero mode. There is a new style of action designed for this movie that is being called Kato vision. It basically means the weapons that bad guys are holding light up as a bright red and then fly at the screen, showing us that Kato is processing them. While that is happening, he goes to work beating bad guys up, primarily by disarming them as quickly as Possible and then using their weapons he. It is a very cool technique. There’s a lot of slowing down the movement speed here, where the villains move in slow motion while Kato runs all over the place kicking their buts at normal speed. I don’t really like that technique, and haven’t liked it since The Matrix, but here since it is combined with the Kato vision, it works. The action in this movie is pretty good. Kato is great, and I love Rogen’s reactions to things. For example, the knife-like contraption that comes out of the wheel of their car and destroys other cars that are next to them, Britt refers to as “the Ben-Hur thing,” referring of course to the chariot race. Cameron Diaz is in this movie too, as the love interest, and she’s fine, but hardly memorable compared to everyone else involved. As the movie goes on, it does lose our interest, and that’s unfortunate since it’s first half was so promising. When Kato and Britt go at it for a lengthy fight in the mansion, it is just stupid. And the villain changing his name and appearance towards the end of the movie is kind of dumb too. Especially when he comes up with a line to say to people before he kills him that takes time just for us to process. Basically, the comedy that worked so well in the first half kind of falls flats in the second half. I think by the second half of this movie; we were ready to get deeper into the plot and the action. Now there are new plot developments in the second half, such as a Potential corruption deal that Britt’s father might have been involved in, but it all seems convoluted as opposed to breezy and light. Even the action, as the movie heads to a climax, becomes forgetful and over the top, causing us to lose interest. This movie had a lot of things going for it, and was often a great deal of fun, but by the end it definitely ran out of steam.